One of the cool things about reviewing CDs is seeing what your colleagues are listening to and catching their ear. A lot of times I get turned on to an artist that I might never have had the chance to be exposed to had it not been for a review of their work by one of the fine writers that contribute to this site. A few months ago I read the review of Nick Curran's Fixin' Your Head (Blues Bytes Febuarary Surprise) and went in search of a copy and was promptly floored by what I encountered on that recording. So it was no surprise when Nitelife Boogie (Texas Jamboree), the second release from one of the most thoroughly entertaining artists to emerge as of late, was as good if not better than his debut, with it being somewhat bluesier in overall presentation and feel. 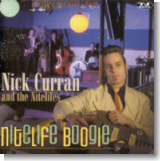 Nick Curran is one of those far and few between artists that can sell just about any song he sings or plays. Nitelife Boogie picks right up where Fixin' Your Head left off, with the 14 numbers being divided between covers and Nick's scintillating original songwriting. This album wastes no time in getting down to business with a frantic cover of "I'm Glad, Glad" that will make you sweat from just listening to it, as will the album's closer, "Don't Jive Me Baby." Following up is the title track that swings to a more relaxed tempo with a smattering of jive circa the mid to late '40s. A splendid version of "Lowdown Dirty Shame" and the two Curran originals that follow, "Close To Midnight" and "This Time I'm Out The Door," are drenched in the sounds of Chicago's west side. All three are augmented by Nick's stunning T-Bone Walker meets Charlie Christian to jam with Dave Alvin guitar chops, that come across as a completely original style belonging solely to Curran. The shuffling dilemma of "She's Fifteen" and the bopping strut of "Jukebox Mama" further demonstrate the mature songwriter that is emerging from this very talented young man whose cutting vocals are reminiscent of a bygone era of smoke-filled roadhouse juke joints, cheap beer and fast women. Joining Nick once again is Eric Matthew Przygocki plucking an outstanding bass line on the upright, T.D. "Murph" Motycka blasting away on the sax with Jimmy Trimmier, and a pair of new faces, T. Jarrod Bonta and Phillip Law, on piano and drums. Nick Curran is a welcome breath of fresh air to the blues these days, bringing a certain vitality that youth usually provides, coupled with a poise that is found in seasoned veterans. With masterful guitar playing, highly original songwriting, a voice that is captivating and a tight supporting band, Curran posses all the tools he needs to become a very major player in both the blues and rockabilly genres. One listen to Nitelife Boogie will convince you of that I'm sure. This guy is going to be around for many years to come.